Big dogs take up a lot of space, but they also have a lot to offer. This gallery is designed to give you a sampling of breeds which are classified large due to their height or massive body structure. Just understand that whenever you're dealing with exceptionally large dogs, early socialization and obedience training are essential to developing trustworthy companions. If you want to learn more about a particular breed, just click on "More Details" above the photo. 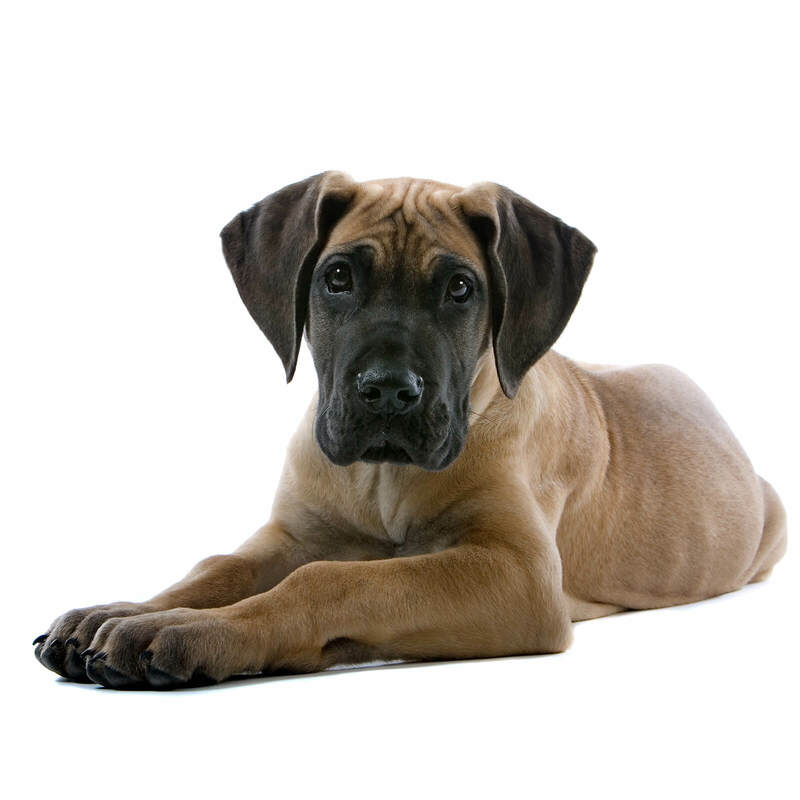 The Bullmastiff averages 27 inches tall and weighs around 130 pounds. Although these dogs look intimidating, most are very sweet and loyal to their families. The Great Dane stands 32 inches tall or higher, and males are typically slightly larger than females. While they can be a bit rambunctious and clumsy as puppies, these dogs mature into gentle giants that make excellent family companions. Unfortunately, many Danes have a limited lifespan of six to eight years on average. The Great Pyrenees is an impressive breed that averages 32 inches tall and weighs in around 100 pounds. These dogs make highly loyal family pets, but they tend to be wary of strangers entering their perceived territory. They also require a bit more grooming than many of the larger breeds since their thick coats need to be brushed out every few days to keep mats from forming. The Irish Wolfhound stands at least 32 inches tall and weighs approximately 120 pounds. Originally bred for battle and hunting, the modern Wolfhound is a friendly dog who likes to watch over his family and go for romps in the park. These dogs are relatively low maintenance and mainly require occasional brushing and nail trimming. The Neapolitan is a striking mastiff that stands around 31 inches tall and can weigh 150 pounds or more. His wrinkles make him look even bulkier like he has too much skin for his frame. Neapolitans are known for their steady temperaments, but they can be protective of family members and don't like having strangers around. The Newfoundland is a big dog that usually stands about 28 inches tall and can weigh up to 150 pounds, but that's not the most impressive thing about this breed. Many people value Newfies for their marvelous temperaments and adults are particularly good with children. They are thoughtful, intelligent and trustworthy family companions. The only issue is that their loose jowls cause them to drool. Standing about 27 inches tall and weighing in around 130 pounds, the Rottweiler is a muscular, powerful breed. These dogs are natural guardians and should begin obedience training by the time they are six months old. Without this training, owners may find their dogs have taken over the leadership position in the home. They also need a good deal of exercise and mental stimulation. On the lighter side, a well-trained Rottie can be a light-hearted, affectionate companion. The Saint Bernard is an iconic breed which stands approximately 27 inches tall and can weigh up to 200 pounds. These dogs are typically eager to please their people, but early training is essential to establish good behavior and control over puppies before they reach full size. These dogs come with short or long coats, and both types only need occasional brushing. The Dogue de Bordeaux averages around 27 inches tall and 130 pounds. As part of the Mastiff group, these dogs have massive heads, and tend to drool due to their hanging jowls. Bordeauxs can be incredibly devoted to their families, but they can also be quite stubborn if they haven't received proper socialization and training as puppies. Despite their size, these dogs crave companionship and shouldn't be kept strictly outside. Big dogs obviously aren't the right fit for every home, but when they are, you sure get a lot to love. Just make sure you're prepared to provide the kind of active ownership and firm boundaries they need to become well-behaved companions. If this sounds like a bit too much to handle, perhaps a small or medium dog might be a better choice for your lifestyle.